Deadbeat “ministry” run by Bradley Dean Smith given the boot under court order for nonpayment of rent. 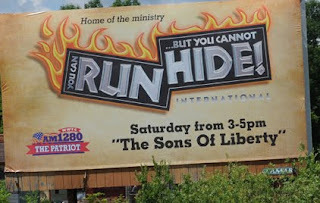 Bradley Dean Smith, aka “Bradlee Dean,” and his Annandale-based anti-gay hate “ministry” found out that you can run, but you cannot hide—from the landlord. In 2007, Smith’s Old Paths Church Ministries, dba You Can Run But You Cannot Hide, was evicted under court order from its offices in the Bass Lake Business Centre II in Plymouth for nonpayment of rent. 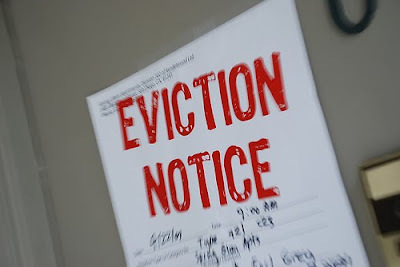 The eviction was the result of a complaint filed against Old Paths Church Ministries in Hennepin County Housing Court on June 7, 2007, by its landlord, Bass Lake Realty LLC of Minneapolis. According to Hennepin County Housing Court records, an eviction hearing was held June 21, 2007. A judgment against Old Paths Church Ministries and a “writ of recovery of premises” was issued the same day. It appears that Smith had flown the coop by then, because court records state that the writ of recovery was returned six days later and had to be re-sent to a forwarding address. Although Old Paths Church Ministries was never served, court records state the writ of recovery of premises was satisfied on July 5, 2007. At the same time Old Paths Church Ministries was welshing on its rent due Bass Lake Realty, it was operating as a self-described “sham” ministerial trust and owned a house and property in rural Annandale valued at $361,600. The house was—and still is—occupied by Smith, who was paid a $45,887 housing allowance by You Can Run But You Cannot Hide International in 2009. Smith still lives there, but the property was transferred into his name in 2009 after he and his sidekick Jake MacAulay took legal action to escape from their sham trust. No 2007 tax records are available for either Old Paths Church Ministries or You Can Run But You Cannot Hide, so it’s not known what either entity’s income was that year. Also unknown is the amount of rent that deadbeat tenants Old Paths Church Ministries failed to pay. Neither Smith nor Bass Lake Realty LLC returned phone calls regarding this story. Thanks for all the work you're doing on this story - I am glad the word about this group is getting out there. Just think of Ripple in Stillwater as a public service. I bet they'll make amends for their past bad behavior. Now that the Radical Media is on it. Funny how that works- no filings-maybe that prevented a creditor from filing against the 'church'. Bradley and Jake are lovers. I think you posted so effective content about on rippleinstillwater.com.It is a popular website for human beings.Among this site is display about many matters.So,I like this site. Thanks for your informative posting. As I have Greater Eviction Service Solutions provides fast, efficient, and professional eviction services for property owners in Austin, Florida. Demand an eviction these days. Did you consider exchanging with the ultimate Bitcoin exchange company - YoBit. Well it just shows the difference between red state welfare and blue state welfare.